Cabbage is a hardy vegetable that is both abundant, inexpensive and a longstanding dietary staple throughout the world. Cabbage is round in shape with layers of superimposed leaves with the inner leaves often lighter in color than the outer leaves because they are protected from the sunlight. 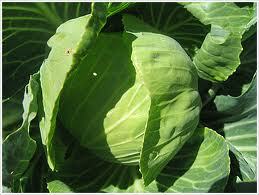 Cabbage belongs to the Cruciferae family of vegetables along with kale, broccoli, collards and Brussel sprouts. Cabbage is fat and cholesterol free, low in calories and sodium, and high in vitamin C.
Cabbage can provide you with some special cholesterol-lowering benefits if you will cook it by steaming. The fiber-related components in cabbage do a better job of binding together with bile acids in your digestive tract when they’ve been steamed. When this binding process takes place, it’s easier for bile acids to be excreted, and the result is a lowering of your cholesterol levels. Raw cabbage still has cholesterol-lowering ability, just not as much as steamed cabbage. In one recent study, short-cooked and raw cabbage were the only types of cabbage to show cancer-preventive benefits—long-cooked cabbage failed to demonstrate measurable benefits. New research shows that steaming is a better cooking method than microwaving if you want to maximize the health benefits of glucosinolates found in cabbage. That’s because two minutes of microwaving destroys the same amount of myrosinase enzymes as seven minutes of steaming, and you need those myrosinase enzymes to help convert cabbage’s glucosinolates into cancer-preventive compounds. Our Healthy Sauté method, which we recommend for cabbage, is very similar to steaming and enhances the flavor the of cabbage. See “How to Enjoy” below. Pac Choi, also referred to as bok choy or Chinese cabbage, is a Chinese leaf vegetable often used in Asian cuisine. The vegetable is related to the Western cabbage, and is of the same species as the common turnip. 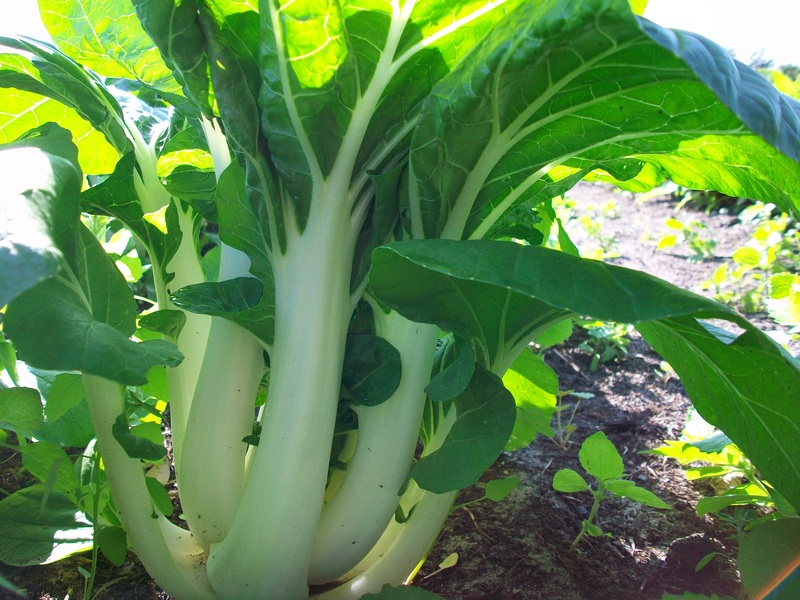 Joi choi is a common and mild-tasting variety of pac choi with dark green leaves and a white stem. Pak choi is fat and cholesterol free, and a good source of vitamin A, vitamin C, and folate. Store unwashed cabbage in a reusable container or plastic bag in the refrigerator crisper for up to seven (7) days. You can also store whole heads, roots intact, by hanging them upside down in a root cellar. Keeping the outer leaves intact will keep the inner leaves from drying out. Note: The vitamin C content starts to quickly degrade once the cabbage has been cut, so use the remainder within a couple of days. Also, handle cabbage carefully to prevent bruising. Any kind of cell damage degrades vitamin C content. Wash thoroughly and then shred finely. Blanch for 2 minutes maximum. Immerse in cold water and pack in reusable airtight freezerproof containers or freezer bags. Half-fill a large pan with water and bring to a rapid boil. Place 1 lb of prepared vegetables into a wire basket and gently lower into the boiling water. Once the water begins to boil again, start timing. Drain the vegetables and then pack as instructed in either freezer bags or reusable airtight freezerproof containers. Clean and prepare whole leaves or wedges and either blanch or leave them unblanched. Lay in a single layer on cookie sheets and place them in the freezer. When fully frozen (12 to 24 hours), portion them into suitable containers and freeze. Leave 1/2 inch of headspace. Store frozen cabbage in the freezer for up to 12 months. Thaw coleslaw in the refrigerator. You can add frozen cabbage directly to dishes. Cabbage can be brined as sauerkraut or made into coleslaw or relishes and frozen. Whole leaves can be frozen unblanched for use as wrappers for baking or stuffing, and used immediately after thawing. Cabbages should not be frozen whole. Store pac choi unwashed in the crisper section of the refrigerator for up to 2 weeks. It may be stored in a reusable unsealed container, plastic bag, or salad spinner or simply by itself in the crisper. Even though pac choi generally keeps well and will stay fresh for up to two weeks, it should be used in four to five days for best flavor. Wash and chop cabbage leaves very small. Put all green leaves in pot with 1 cup of water, steam 15 minutes on high heat. Put the remaining washed cabbage in pot. Steam for 10 minutes more. The outer leaves of the cabbage should be removed. Cut the head into quarters and cut out the stalk. Wash it well in salt and water and leave in the water for half an hour. Then put it into a colander and shake all the water from it. Bring to a boil a large pot of water. When it boils, put in two teaspoonfuls of salt and a quarter teaspoon of carbonate of soda. Put in the cabbage and cover down till it boils up; then remove the lid and boil very quickly, pressing it down into the water from time to time. It will be done in fifteen to twenty minutes. Test with a fork for softness. Remove the cabbage from the water and put it into a colander to carefully press all the water from it. Preheat oven to 425 degrees. Wash and clean the cabbage head and cut the cabbage into quarters. Wrap up the cabbage in the foil and place on a cooking sheet into the preheated oven. Cook 35 to 45 minutes or until desired tenderness. Once the cabbage is done, remove from oven, open foil packets and enjoy. Finally, it's important to remember that we can allow myrosinase enzymes in cabbage to do their natural work by slicing, shredding, or chopping raw cabbage and letting it sit for 5-10 minutes before cooking. Once the cells in cabbage have been broken apart through slicing, shredding, or chopping, the myrosinase enzymes in those cells can become active in converting the glucosinolates in cabbage into isothiocyanates (ITCs). Want to learn more about how cutting, slicing, and chopping may affect fresh vegetables like cabbage? See our Q+A on this subject here. The whole joi choi plant is edible. To clean, chop off enough of the base of the joi choi plant before washing so that stalks can be cleaned individually. Rinse stalks and leaves under running water, using a vegetable brush if they are especially dirty at the base of the stalk. Joi choi stalks can be consumed raw with dip, or chopped and used in salads. Joi choi has a high water content and becomes limp very quickly upon cooking. It should be cooked very quickly over a high temperature so that the leaves become tender and the stalks stay crisp. In Chinese stir-fried dishes and soups, choi is added toward the end of the cooking process. Since the leaves cook much more quickly than the stalks, it’s a good idea to add the stalks first and then the leaves about a minute later. Cut the stalks into 1/2-inch (1.25cm) pieces before cooking. To Boil: Cook stems in salted water for four minutes and leaves for two to three minutes. To Steam: Allow pieces to steam for about six minutes or until tender-crisp. To Sauté: Stir-fry the stalks over high heat for about six minutes and the leaves for about three minutes or until the stalks are tender-crisp and leaves just wilted. Cabbage is an excellent source of vitamin K, vitamin C, and vitamin B6. It is also a very good source of manganese, dietary fiber, potassium, vitamin B1, folate and copper. Additionally, cabbage is a good source of choline, phosphorus, vitamin B2, magnesium, calcium, selenium, iron, pantothenic acid, protein, and niacin. The following nutrition information is for one cup (70 grams) of shredded pac choi (listed as Bok Choy on the website below).